This post covers 2011. In this period the party in Scotland elected a new leader. Murdo Fraser, many of his supporters and Party financiers were brutally sidelined by David Cameron and his Westminster Tories in favour of his protege Ruth Davidson. A chosen group of arrogant, bigoted and racist “Tory young Turks” studying at Glasgow University was put in place providing “troops on the ground” in support of Davidson. Mr Macaskill, who was virtually guaranteed a seat in the Holyrood elections on May 5, was kicked out by Mr Fulton, a former MI5 official. Mr Fulton made no mention of the reason for the dismissal, merely saying Mr Macaskill had been dropped “following discussions between the candidate and the party’s candidates’ board”. The chairman thanked Mr Macaskill for his service and announced that Ruth Davidson, a close aide of Annabelle Goldie and a former BBC producer, would be placed at number one on the list. Mr Macaskill was responsible for recruiting several wealthy donors, including Mr Coakley, a former professional footballer with Dundee FC who subsequently made his fortune buying and selling property in London’s Mayfair. Estimated to be worth £70million, Mr Coakley announced two months ago that he would donate £100,000 per year for the next 10 years to Scottish Tory coffers. The same source said Mr McGlynn, whose companies own airport car parks all over Europe, and who also donates funds to the party, may also withhold future donations. Last night, Mr McGlynn said “This is outrageous. to penalise someone in this way is completely wrong. 29 March 2011: Tory Party’s Holyrood election campaign in disarray after a third candidate steps down, this time as a regional list hopeful. David Meikle withdrew in Glasgow because he felt that his allegations of vote rigging on the list for the city had not been sufficiently investigated. Mr MacAskill’s, who has been removed from the top of the Glasgow list will be replaced by Ruth Davidson, a former BBC journalist, this means she is likely to become an MSP. Miss Goldie admitted that she did not have any say in the departure of Mr MacAskill. The Tory hierarchy in London, who are directing the campaign are said to be delighted with the way it is being run north of the Border. The Tories also insist their budget for the 5 May election is in place despite reports that wealthy donors, including former Dundee FC footballer and property magnate Tom Coakley and airport car park magnate John McGlynn, had withdrawn their funding. 25 September 2011: Ruth Davidson in trouble again over her campaign tactics. Ruth Davidson is facing more questions over her bid to lead the Scottish Conservatives after asking for funds to carry out campaigning measures which her team cannot be sure they can deliver. Davidson, a Glasgow list MSP, has told supporters specific sums will cover the cost of producing leaflets, mailing personalised letters, and canvassing thousands of party members by phone. * £30 The cost of producing 1000 campaign leaflets. * £50 This will enable us to send out 200 personalised letters. * £365 The cost of telephone canvassing 2000 people. But her team was last night unable to guarantee that donations to Davidson would actually deliver the services described on her website. Her campaign manager admitted the figures and text had been cut-and-pasted from the UK Conservative Party website, and refused to say if Davidson actually had the addresses and phone numbers needed to make good on her pitch. John Lamont MSP told the Sunday Herald: “We are relying on our supporters and activists to supply us with email addresses and names and addresses of people who might want to hear from Ruth. Pressed on whether Davidson’s campaign possessed the contact details needed to mail 1000 leaflets or phone canvass 2000 of the party’s activists – almost a quarter of its 8500 members – Lamont repeatedly refused to say if it had. Davidson, 32, who has only been an MSP since May, is already facing questions about her judgement and relative inexperience. On Friday, it emerged her campaign team is being investigated by the UK Information Commissioner’s Office (ICO) after sending material to party members’ private email addresses. A Tory councillor who received unsolicited updates from Davidson has asked the ICO to investigate how she got his private address. Earlier this month, Davidson was forced to sack her parliamentary assistant, Ross McFarlane, after this newspaper uncovered mobile phone footage of him setting fire to an EU flag in a Glasgow street while dressed in a dinner jacket. Davidson, a former BBC reporter, is the choice of the Tory establishment. She is backed by a number of party grandees, including Thatcher-era ministers Lord Sanderson and Lord Forsyth and donor Sir Jack Harvie, and is understood to have the support of David Cameron and the current leader, Annabelle Goldie. However, an online poll of activists this weekend showed her trailing her main rival Murdo Fraser, who is backed by most Tory MSPs and a third of Tory councillors north of the Border. Fraser is campaigning to abolish the “toxic” Scottish Conservative and Unionist Party and start afresh with a new centre-right party. Speaking at a leadership hustings in Inverness yesterday, Davidson attacked Fraser’s big idea, saying if she won she did not want her first meeting with the Prime Minister to be about “suing for divorce”. 1 October 2011: There’s yet more trouble for Tory establishment candidate Ruth Davidson today. The rival camps in the leadership contest are angry that party spin doctor Ramsay Jones may have been giving her a hand in defiance of the chairman’s orders. Ramsay Jones, who as head of media has to be neutral in the contest, recently attended a meeting at Ruth Davidson’s home with her campaign strategists. He appeared at the gathering after the party’s chairman instructed staff not to take sides. The revelation will confirm suspicions among the other candidates that 32-year-old Davidson, the least experienced of the four contenders, is secretly being aided by the party establishment. It will also raise questions about Davidson’s judgement in allowing a supposedly neutral member of staff to participate in her campaign. Early last month, the campaign team of another candidate, Murdo Fraser, raised concerns with party chairman Andrew Fulton about whether Jones was helping Davidson. Fulton told Fraser’s campaign that the matter would be looked into. The chairman then informed staff they had to remain “strictly neutral” during the contest. Fulton also gave Jones the same message face-to-face. It is further understood that another candidate, Jackson Carlaw, spoke to Jones directly about his concerns. However, despite Fulton’s order, Jones attended a meeting at Davidson’s home in Glasgow’s west end on Sunday September 18. Jones lives in Dunbar, which would make his Glasgow visit a 150 mile round trip. The session focused on various strands of the Davidson campaign. The Jones row is the latest blow to Davidson’s campaign. Last month, she was forced to sack a parliamentary assistant after mobile footage emerged of him setting fire to an EU flag as a friend made sectarian taunts in a Glasgow street in November 2010. It was also revealed Davidson was under investigation by the UK Information Commissioner’s Office after her team sent unsolicited emails to members’ private accounts. Davidson was facing even more questions last weekend for raising donations to fund campaign activity she was unable to guarantee, including canvassing almost 2000 members by phone for £365. A source close to Davidson said she and Jones had been friends for ten years. Jones, 51, has worked for the party since 2000 and is one of Holyrood’s most tenacious political survivors. He is the Scottish Tory equivalent of former spin doctor like Alastair Campbell. The former financial adviser worked for David McLetchie before his leadership of the Scottish Tories at Holyrood ended in an expenses scandal in 2005. Since then, he has worked for Annabelle Goldie and been one of her closest confidantes. Davidson last night said there had been no “campaign team” meeting on September 18. However, her team did not deny there had been a meeting which focused on campaign issues. The Scottish Conservatives’ chief spin doctor Ramsay Jones has been suspended from his duties during the current leadership contest. It follows newspaper claims that he attended a meeting held by one of the candidates, Ruth Davidson. A voicemail on Mr Jones’s phone says he is taking time off. Organisers in other campaign teams have been told that Mr Jones’s decision follows a meeting with the Scottish Party chairman Andrew Fulton. The chairman had previously informed Tory staff that they had to remain “strictly neutral” during the contest. Miss Davidson is hoping to succeed current Tory leader Annabelle Goldie. She is competing against Murdo Fraser, Jackson Carlaw and Margaret Mitchell. A political war of words broke out yesterday after the Scottish Conservatives accused Labour and the SNP of being reactionary parties determined to prevent reform in Scotland. David Mundell, the only Conservative MP in Scotland, also said that ideas which could improve heath and education were ignored because the “little book of Scottish Labour mythology” had spread “irrational fears” about the Tories. But Labour and the SNP both immediately hit back accusing Mundell of insulting Scots. Labour claimed the problem for many voters was that the legacy of the last Conservative government was “no myth”. Mundell told delegates at the Tory Party conference that Labour and the SNP were not interested in “Scottish solutions for Scottish problems”. Ruth Davidson suffered a blow to her credibility when it emerged she faced hostility from party activists in what should have been safe home turf in Glasgow. All five party chairmen in Glasgow pledged their support to other candidates. The least experienced of the four candidates for the leadership, the 32-year-old was promoted as the favourite of the Tory establishment, with backing from Thatcher-era grandees Lord Forsyth, Lord Sanderson, and the sole Scots Tory MP, David Mundell. Her campaign was plagued by gaffes and rumours that she received unofficial help from the Conservative Party hierarchy. She was also ordered to sack her parliamentary assistant Ross McFarlane after he was caught on camera drunkenly burning a European Union flag in a Glasgow Street as a companion made sectarian remarks. In a further unwanted development the Director of media, Ramsay Jones, was suspended from his duties when it was revealed that he attended a meeting of campaign strategists at Davidson’s home, despite being ordered by the party chairman not to take sides and remain impartial. Her camp insisted there was nothing untoward about the visit which required Jones to make a 150-mile round trip from his home in Dunbar, East Lothian, on a Sunday during the campaign. Malcolm Macaskill, a former Holyrood candidate, claimed Jones had previously boasted he was a “big fan” of Davidson and had recruited her to the party about three years before. He said “I was disappointed to hear he may have been supporting Ruth Davidson’s campaign for leader. Macaskill, a member of the Scottish Tories for 35 years had been the Tories’ No 1 candidate on the Glasgow list for Holyrood. but in a surprise move was deselected by the party hierarchy shortly before the election. His removal meant Davidson, who was running Goldie’s Holyrood office, moved to the top of the list. Without the switch, Davidson would not have been elected as a list MSP for Glasgow. Ballot papers go out to around 9,000 Scottish Conservative members tomorrow, following a week in which the already bad-tempered contest turned increasingly bitter. The debate has been charged by deputy leader Murdo Fraser’s plan to disband the party if he wins and form a new right-wing Unionist group. Voting could still be halted after the Tories’ chief spin doctor, Ramsay Jones, was suspended over allegations of bias towards Ms Davidson who yesterday launched a five-point plan, including conquering “no go areas” for Conservatives in Scotland’s working class heartlands. But with former leader David McLetchie declaring for Mr Fraser on Friday, the former BBC journalist has the backing of only two out of 15 MSPs. Much of her support is from Westminster, including Scotland’s only Conservative MP David Mundell. A member of Mr Fraser’s camp yesterday compared Ms Davidson to Labour leader Ed Miliband, who defeated brother David – who enjoyed the most parliamentary support – using trade union votes. The source said: “Whoever wins we are all going to have to work together but in Ed Miliband we have seen the difficulties of somebody getting elected who doesn’t have the support of their parliamentary colleagues. Launching her new plan, Ms Davidson described it as the “five big steps we need to take to make this the decade the Scottish Conservatives win again”. She wants to revamp party funding and stop the reliance on a handful of big donors; recruit thousands of new members; set up policy commissions on business and agriculture; introduce new campaigning methods; and bringing in better candidates to stand in every seat in Scotland. 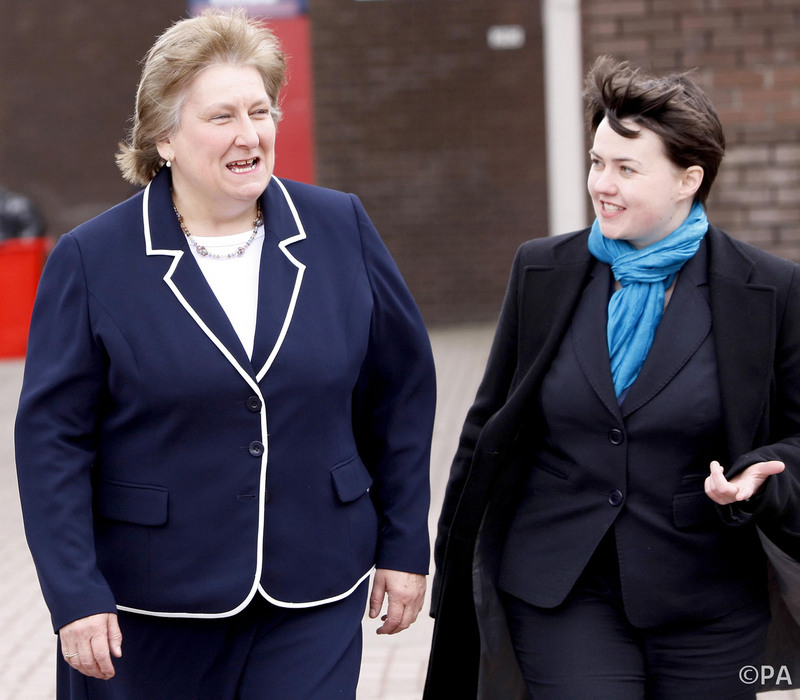 The Scottish Tory leadership race is in crisis with three of the four candidates demanding an independent inquiry into allegations of “party bias” in favour of Ruth Davidson, who has high-profile backing. The campaign managers for the trio – Murdo Fraser, Jackson Carlaw and Margaret Mitchell – have written jointly to chairman Andrew Fulton calling for a probe into claims Davidson has received an unfair advantage in the increasingly bitter race. In a sign of the civil war raging within the Tories, John Lamont MSP, Davidson’s campaign manager, hit back at what he called a “deliberate, vicious and frankly desperate” bid to smear her, and accused others of being prepared to embarrass the party in a “shocking display of naked self-interest”. The extraordinary developments suggest whoever replaces Annabelle Goldie as leader on November 4 will inherit a party riven by internal feuds. Though only elected as a Glasgow list MSP five months ago, Davidson has support in the Tory hierarchy, with backing from grandees such as Lords Forsyth and Sanderson, and Scotland’s sole Tory MP, David Mundell. Earlier this month the Scottish party’s top spin doctor, Ramsay Jones, was suspended after attending a meeting of campaign strategists at Davidson’s Glasgow home, despite being advised to stay neutral. At a hustings last week, Davidson agreed under hostile questioning that the gathering had discussed the campaign. She said no more about the matter. It is understood she had been advised it would be imprudent to discuss Jones’s situation as it concerned his contract of employment. It is also understood that those claiming “institutional bias” have been told they must produce evidence to support their allegations. The UK Information Commissioner’s Office has launched an investigation after Davidson’s campaign team contacted Tory party members via private email addresses. Two of Davidson’s rivals, Fraser and Carlaw, asked for an external body to oversee the ballot of the party’s 8500 members. Scottish Tory HQ refused the request. Now the Sunday Herald can reveal that Davidson’s rivals are calling for an interim inquiry while the contest is ongoing. The decision followed a conference call between all four campaign managers and Fulton on Wednesday about disputed comments by Davidson at a leadership hustings in Glasgow two days earlier. After the meeting failed to clear the air, the managers for Davidson’s rivals sent a letter to Fulton calling for an independent probe. It is understood the party has asked for evidence of alleged bias. One campaign source said: “There are people in the party paying scant regard to the proper procedures in an internal election”. There had been a “greying and blurring” of the need for neutrality, the source added. Despite being on political home turf for Monday’s hustings, Davidson received hostile questions from several members about controversies surrounding her campaign, including having to sack her Holyrood assistant Ross McFarlane for drunkenly setting fire to an EU flag in the street at two in the morning. Reacting to the call for an inquiry, John Lamont said: “The latest attempt to try to smear Ruth Davidson and her campaign with unsubstantiated, false and potentially defamatory accusations is astonishing and deeply depressing. “No one should be in any doubt that this is a deliberate, vicious and, frankly, desperate attempt to discredit Ruth in the eyes of our members and the general public. Further, it underlines the hugely disappointing fact that some people are prepared to embarrass the party in a shocking display of naked self-interest. The accusations that there has been institutional bias by officials within the party towards Ruth and her campaign are utterly false. Those now pressing for an investigation have produced no evidence to support their accusations. Despite the growing number and frequency of personal attacks on Ruth, she has been determined not to be brought down to this level. Mundell’s said “it’s ‘time we got tough with the big six energy companies” and this just weeks after his Government refused Dumfries and Galloway MP Russell Brown’s calls to bring in the Competition Commission to “break the stranglehold” that the big six energy companies have on the market and for tough action to bring down bills. Russell Brown said: “This is the absolute height of hypocrisy from Mundell. He can’t expect us to believe that he is serious about bringing down energy bills when the Government in which he a Minister refused my calls for tough action. I wanted them to bring in the Competition Commission to break the stranglehold the big six energy companies have on the market, but they washed their hands of the problem and said there is nothing they can do. The Tory’s are shifting the blame onto local people by criticising them for not switching their supplier. Local people don’t want lectures from politicians, they want decisive action to bring down their gas and electricity bills. While I agree that tariffs need to be made more transparent, it isn’t enough because that alone won’t bring down bills. The problem is that there is no real competition in the energy market because the big six suppliers act as a pack. 30 October 2011: Tory Leadership Candidate Ruth Davidson, under pressure after claiming on television to be committed to Scotland while failing to mention she was shortlisted to become an MP in England. However, only last year, Davidson was one of six figures shortlisted to be a Tory candidate for Bromsgrove, south of Birmingham. The English seat had been left vacant by the exit of sitting MP Julie Kirkbride, who chose not to stand again after a row over her expenses. After local members in Bromsgrove chose Sajid Javid, Davidson stood for the Tories in Glasgow North East instead, a seat she had contested the previous year in a Westminster by-election. She went on to slip from third place to fourth in Glasgow North East at the general election. Davidson’s spokesman said she had been put on the shortlist by Conservative Central Office in London. Asked if she attended any selection meetings in Bromsgrove, her spokesman said Davidson “went down to see them” out of “courtesy”. After the election, Davidson tried unsuccessfully to become the Tory candidate for the Holyrood seats of Edinburgh Central and North East Fife. She finally found a berth as candidate for Glasgow Kelvin, where she came fourth in May’s election after the Tory share of the vote fell. Davidson, a former BBC reporter who joined the party less than three years ago, was then elected as a Glasgow list MSP. Her Bromsgrove link is understood to have irked many Tory activists in Glasgow and contributed to her lack of support in the city in the contest. The 32-year-old failed to win the backing of any of the five Conservative association chairmen/women in the city, or Glasgow’s only Tory councillor, David Meikle, or the former Glasgow MSP Bill Aitken. The Bromsgrove episode appears to have been airbrushed from Davidson’s website and CV. In her first official act the new Scottish Tory leader Ruth Davidson confirmed that she did not urge David Cameron to alter the Scotland Bill in order to reflect Scottish public opinion. Her position, bowing to London on the constitution emerged after she met with her party boss in Downing Street. She went on to stress her pleasure in meeting the Prime Minister and signalled that she would not adopt any policy positions which he might disapprove of. She further stated that she had a mandate to speak for Scotland, claiming that the Coalition parties received more votes in Scotland at the UK general election than the SNP did in their historic victory in May. The SNP immediately leapt on her claim, and issued a statement pointing out that the SNP received 902,915 votes in May 2011, 45.4% of the popular vote, whereas in May 2010 the Conservatives and Lib Dems together received a total of 878,326 votes, or 35.6%. She then implied that she supported moves for Westminster to seize control of the timing and question of a referendum on Scotland’s place within the UK, a position taken by Michael Forsyth, a prominent supporter of Ms Davidson’s leadership bid. She claimed that the democratically elected majority Scottish government may “rig” the vote and that this would not be tolerated. She dismissed support for greater Scottish autonomy as “nationalist shenanigans”. “This is a real blunder by Ruth Davidson, continuing her bad start as the new Tory leader in Scotland. “After talking big about David Cameron coming to Scotland and not being her leader, Ruth Davidson’s first act is a day trip to London where David Cameron is her boss, thus revealing the truth about Ruth’s leadership – the Tories remain the same London-led party, and they will continue to be rejected by the people of Scotland. “She has also been caught out in a clear statistical fiddle. Far more people voted for the SNP this year than voted for the coalition parties at the UK General Election last year, and we also got a much higher share of the vote than these two parties combined – which came third and fourth in Scotland last year, behind the SNP. If Ruth cannot tell the truth about the dismal electoral state of the Tories in Scotland, and their Lib Dem hangers on, then she clearly doesn’t appreciate the scale of the challenge facing her – which at least Murdo Fraser showed an appreciation of. “The inconvenient truth for the Tories is that the referendum, which will be held in the second half of this parliament, is a matter for Holyrood to scrutinise and deliver – not Westminster; it is part of the resounding Scottish democratic mandate achieved by the SNP in May. If the Tories and other Westminster parties have difficulty grasping that very basic concept, it is a good illustration of why they are so badly out of touch with the aspirations of the people of Scotland. “The SNP Government have always made it clear that we are entirely willing to include a ‘devo-max’ option in the referendum. And a majority for independence on a straight Yes or No question will deliver independence – according to the democratic wishes of the people – and we are confident of success in securing a Yes vote. “We know from the Scottish Social Attitudes Survey that a strong majority, 74 per cent, of people believe that the Scottish Government should have the most influence over how Scotland is run, compared with just 16 per cent who think it ought to be the UK Government. “I am proud that it is the UK Government which is enacting a new Scotland Bill which will transfer significant extra powers to Holyrood and place the responsibility for raising billions of pounds of public spending in the hands of the Scottish Parliament. This will meet the demands of the Scottish people for more say over how Scotland is run and clear the way for a straightforward and clear-cut referendum on ‘yes or no’ to Scotland in Britain. Mr McGlynn went on to express his anger at the way in which Mr Macaskill had been removed from the Glasgow Regional list and the interference in the leadership election process by Tory Head Office and said he and other financial donors had made no decision on future donations, but he added that he “wanted to support” the party. 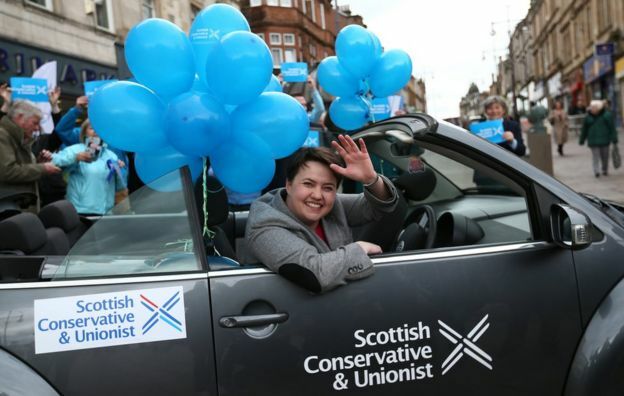 12 November 2011 Two weeks since Ruth Davidson’s election as leader of the Scottish Conservative and Unionist Party and it has not been an auspicious start. No sooner had she been elected than she sacked the Party Chairman Andrew Fulton and replaced him with David Mundell, probably the most divisive figure in the party, with immediate effect. Goldie once said, “I smell fish” and we all know fish rot from the head down. So two decisions that would hardly do anything to unite the bruised party behind her – what next the humiliation of her opponents? Well Davidson tried but on this point she failed – and miserably. Desperately rushing to Downing Street for a photocall with the prime minister she left behind her group of demoralised MSPs and the need to pull them together with the appointment of briefs that would make them feel valued. On returning she tried to humiliate Murdo Fraser by keeping him as Deputy – a position that was clearly untenable for him to hold under the circumstances and showed her lack of experience in the chamber where he would have been ridiculed and she would have suffered regular shouts of “watch your back”. Instead Murdo had made it known he could help Davidson by running the campaign against the break-up of the UK, something that would keep him out of her path and which in policy terms they could broadly agree on, but this would keep Fraser in the public eye and she was advised against it. Davidson decided she needed this role for herself. Having already been Education and Health spokesman and, his offer being turned down, Fraser had no alternative but to go to the backbenches,. This would be spun later as him being unwilling to help, but the offer was there, it was Davidson that rejected it. Next Davidson tried to demote Fraser’s campaign manager Liz Smith from Education to rural affairs, but Smith refused – clearly willing to go to the backbenches with Murdo if she was moved. This would look too dangerous and might have encouraged others to do so; certainly others were in a recalcitrant mood following the reappearance of Ramsay Jones. Davidson backed down and left Liz Smith alone – but it was now an open secret and Davidson’s reshuffle was looking like an utter shambles. Flattered by the idea that he could later be lined up to become Party Chairman Jackson Carlaw agreed to become Davidson’s deputy, despite close friends telling him he should decline. That done the other positions became easier to accommodate but the damage to her reputation had been done and it was still the first week. Other episodes added to the calamitous nature of her triumph. Davidson was quizzed on her support for bringing back prescription charges and asked at what level of income people would have to start paying – a question that flummoxed her and revealed a poor grasp of policy. The dog in the street could have told her that there never has been an income threshold – prescription charges were never means tested but given free by what is called the passport system – if you are on a benefit, in full time education, under 16, pregnant, blind etc. etc then you had a passport to free prescriptions – otherwise whatever your income you paid. The failure to grasp such a simple concept was damning. Davidson’s minders had better start the media training for the media professional, and fast. Finally, as if to rub salt into the wounds of the 47.5% of voting members that supported Fraser, Davidson sent out a letter to everyone first class thanking them for electing her – no recognition that she had only a third of the members behind her, no recognition that the majority were against or indifferent to her – just a presumption she was the chosen one. One member I know cancelled his subs the day he received it. He won’t be the last. What Davidson’s election does for the next five years is close the door on a new centre-right party in Scotland. Unless Davidson suffers such a bad first year and is forced out – and I do not expect that to be allowed by London – then the necessary change is not going to happen this side of any referendum on independence. As Murdo Fraser obviously deduced the referendum must now become the central focus for right-leaning unionists be they inside or outside the Tory Party tent. For all my criticism of her poor start Davidson should be given time and support to show that youth and dynamism can change her party’s fortunes, for those are pretty much her sole strong points. On a personal level Davidson must be congratulated for she has come a long way in the last few years. Only joining the party two years ago she was thrust into the limelight as the Tory candidate in the 2009 Glasgow North East by-election to offer a fresh face with a media savvy approach. She polled a poor 5.2 percent, only 62 votes ahead of the BNP on 4.9 percent, but saved the party from the embarrassment of losing its deposit. At last year’s general election she managed 5.3 percent but slipped to fourth behind the Liberal democrat. Between the two elections she had sought the nomination for Bromsgrove when Julie Kirkbride announced her resignation but she was passed over. Looking to the Holyrood elections Davidson secured the candidacy for Glasgow Kelvin but was ranked second on the regional list by party members, a fate that guaranteed she would have to wait another four years. Then came 2011 and what a year it has been. As the election kicked off the Conservative establishment removed Malcolm Macaskill from the head of the list by e-mail in circumstances that still remain shrouded in mystery and speculation. True, Macaskill had a troubled financial history in the past but he had always been open about it and the party had not prevented him being a candidate for Westminster or Holyrood on three subsequent occasions. Although the Tory vote in the Glasgow region fell to an all time low of 6.1 percent it was still enough to return Davidson as one of the seven list members. It had all been a tough learning curve and does suggest she is a fighter – more a Joe Frazier than a Mohammed Ali – but Frazier did have his victories. Finally she was elected and because of her breezy personality and the familiarity of being in front the cameras was soon tipped for the future – by which most people meant in five or ten years time, not six months. When in May Goldie announced it was time to give up her crochet needles, many thought John Lamont would stand as the establishment candidate in an effort to prevent Fraser succeeding as leader, for fear that he would adopt a more obviously independent and resolutely Scottish approach. Davidson’s fortune was still in when Lamont made an injudicious speech about faith schools that broke with party policy and countered the Tory ideal of parents choosing their children’s schools for themselves. Despite being heavily courted and talked-up Lamont displayed a glass jaw and withdrew. The establishment’s attention switched to Davidson – it was a long shot but she has drive and a CV showing more life experience than the prime minister – and for modernisers the cachet of being gay – a counter-intuitive idea to most people who think Conservatives must be, well, socially conservative. I should at this point reveal the unspoken truth that anyone active in British politics knows, there are more gay people in the Conservative Party than probably the other parties put together – it’s just that no-one makes a song and dance about it. Why would they, the market is blind to personal sexuality and most Tories think it matters not a jot to one’s politics. When the leadership election was launched it was taken by the scruff of its neck by Murdo Fraser’s frank analysis that the Scottish Tory party was not fit for purpose and that he would create a new party that could give the wider right-of-centre constituency a fresh start. Davidson was by now being implored by the vested interests within the old establishment to stand and save the likes of David Mundell, Lords Strathclyde and Forsyth and the 13th Marquess of Lothian, more commonly know as Michael Ancram, from being marginalised within the Scottish party. She accepted the offer but thanks to Fraser’s boldness was no longer the moderniser but the arch-traditionalist. On Friday, after a long and often terse campaign, it was announced she had triumphed with 52.5 percent of the 63.4 percent of members that voted backing her. It is a precarious mandate for she was supported by less than half of the members; more than 36% of the membership never voted – more than the 33% that took the trouble to back her. She has at last enjoyed a victory of her own but the real job begins now and no matter how much support she receives from Mundell and Lamont (now Tory Business manager – the equivalent of Chief Whip) it will be upon her that the responsibility will be placed. To date all that we know about Davidson has been the repetition of platitudes based upon her youth and commitment to radical change. Her age is beyond dispute, but so is her inexperience. The radical change appears to be using social media (which is of course open to all the other parties too) and introducing the recommendations of Lord Sanderson’s report that will see constituency associations either disappear or become emasculated – an admission that membership numbers are more than halving every decade. At the current rate of decline you will be able to get ever Tory member into Edinburgh’s Playhouse Theatre by 2020, by 2030 they will number fewer than the crowd watching Hamilton Accies on a Saturday. With the dwindling membership comes a falling activist base. To deliver a revived dynamic party Davidson must therefore drive membership numbers up and get a larger share of them to come out and help. A membership drive has been announced but how this will be funded remains to be seen. In a year’s time it will be a fair question to ask what the membership numbers are to see if Davidson’s dynamism is indeed the answer. Then there is the identity issue. This is wrapped up in the inheritance of the past that Davidson, born in 1978, cannot be blamed for. It was not Davidson that delivered the Poll Tax or introduced the cold economic reality that closed most of Scotland’s mines or steel mills – her first vote in a general election vote was not until 1997 when the Tories were wiped out in Scotland. Her promise to have policy commissions on business and fishing offers nothing new – such is the self-imposed straitjacket her party will not dislocate its shoulder to escape from. More powers that will help business? Davidson has ruled them out by saying the current Scotland Bill goes far enough. Giving Scotland its own fishing policy? That would mean Britain leaving the EU. I don’t think David Cameron will welcome that idea. To establish a Scottish as well as a British identity Davidson has to show she runs the party, not Cameron (which is why rushing to London for that photocall sent the wrong message), and that she puts Scotland’s interests in Britain first. We have heard nothing of how she will achieve this, only Fraser had offered a solution. Goldie accepted without a protest the English Oak as her party’s symbol, will Davidson challenge anything from London or do anything differently? She also has to find the money to run the party. Sir Jack Harvie said he would not help fundraise for a new party – but many of the past Tory financiers backed Fraser and will not now be taking tables at his dinners. The irony of the leadership result is that Davidson would stand a far better chance of dealing with all of the problems of a falling membership, dwindling number of activists, policies relevant to Scotland, campaign finances and a damaged if not toxic brand if she had the new party that Murdo Fraser was proposing. Indeed a new party would have been the obvious place for a 32 year-old lesbian kickboxing Sunday school teacher – along with all the many people that support right of centre policies but slam the door on canvassers’ faces when they finally mention the word Conservative. Davidson would have been an obvious leader for such a new party – but she rejected it. Not one of her challenges will be easier to deal with using the existing moribund institution. Easier to find new members, activists and candidates for a new party? Tick. Easier to raise funds for a new party? Tick. Easier to develop home-grown policies for a new party? Tick. Easier to allow even old faces to shed their skin accepting the mistakes of the past and be reborn through a baggage-free new party? Tick. Unfortunately Davidson has turned her face against these advantages. How she will now attract the many people I met who had never voted Conservative in the past and held little interest in so doing in the future continues to baffle me. Shouting louder and working harder just cannot be enough. On the eve of her election there was a council by-election in the Highlands after a Labour councillor was jailed for fiddling his expenses. The Tory candidate, a keen and respected local lad shouted loudly and worked like a Trojan. He put out more leaflets than his opponents, indeed Labour didn’t even put out any at all. He came fourth. This is the reality of the Tory position. Next May the Conservative Councillors face the same prospect and it will be the first real challenge by which Davidson’s youthful, dynamic shout louder and work harder solution will be tested. Forget how she performs at First Minister’s Questions, it matters not one whit, forget how she does in debates, on committees and running her group – only those that play in the Holyrood village give these any credence. It is the messages that she puts out and the positions she takes that will determine the perception of her party in the public mind and thus its fate at the ballot box. The party’s decline has been masked by the proportional voting systems for Holyrood and our councils and is even worse than the electoral results suggest. Having only one member at Westminster is no fluke for the party of Mundell is truly despised in Scotland. You don’t quite feel that when inside Holyrood but many people I know don’t have another Tory in their workplace. Being proud of her party, as Davidson repeatedly tells us she is, when you haven’t been at the coal face of Scottish politics for twenty-eight of the last thirty years will count for naught with the Scottish electorate. I’m sure Ruth Davidson was proud when she stood and lost twice in Glasgow North East but it didn’t get her even six percent. As a currency, pride in being Scottish Conservative and Unionist has been so debased it is practically worthless. Tory leader Ruth Davidson cast herself as the face of “generational change” during the party’s recent leadership race. But what kind of generation is currently coming through the Scots Tories? Judging by some of the senior members of the Glasgow University Conservative Association (Hon Pres: R Davidson), it could be rather interesting. This fascinating photo shows Ruth with a number of Glasgow University Conservative Association (GUCA) celebrating her election as a Glasgow list MSP in May. The blonde chap kneeling in front with arms aloft is Ross McFarlane, her election agent and GUCA president. She later sacked him as her Holyrood assistant when mobile phone after footage emerged of him drunkenly burning an EU flag in a street while a companion made sectarian remarks about referee Hugh Dallas and the Pope. The incident took place after a St Andrew’s Day dinner (30 November 2010) last year. Ms Davidson had attended the dinner together with guest speaker, UKIP MEP Roger Helmer. Meanwhile, the poker-faced chap on the right of the photo with the square lapel badge is Stewart Green, the GUCA webmaster. He apologised after posting a number of dodgy Tweets about race, including one comparing an Asian festival to cats being strangled. And finally, the dark-haired guy with the blue shirt and blue tie immediately above McFarlane is Colin James Taylor, a former GUCA president, who works for the Tory Press and Research Unit at Holyrood. He posted song lyrics on Twitter glorifying Northern Irish terrorist group, the Ulster Volunteer Force. He also referred to Celtic Football Club as “Tims” on the popular blogging website. Rangers fan Taylor, from Belfast, used the Twitter name “Ulster exile” to post offensive remarks while studying at Glasgow University, where he was president of the student Conservative Association (GUCA) from 2009 to 2010. On that weekend, the UVF was much in the news as Northern Ireland awaited publication of a police ombudsman report into one of the terrorist group’s worst atrocities, the bombing of McGurk’s Bar in Belfast in 1971, which killed 15 people and injured 16. The report, published 48 hours after Taylor’s tweet, revealed that the Royal Ulster Constabulary wrongly blamed the IRA for the attack. The bombing was the worst during the Troubles until the Omagh bomb killed 29 people in 1998. Taylor’s tweet also fell on the eve of the anniversary of the 1979 conviction of the notorious Shankhill Butchers, the ultra-Loyalist gang, many in the UVF, who tortured Catholic civilians and murdered at least 30 people. Taylor’s case has highlighted Davidson’s ties to Glasgow University Conservative Association. According to GUCA’s website, she is the body’s honorary president. She attended its annual dinner on Friday. After the Sunday Herald alerted the Tories about the matter, Taylor’s Twitter and Facebook accounts disappeared. Last week, leading QC Paul McBride quit the Tories over the party’s hostility to an SNP bill aimed at tackling sectarianism in football. Stewart Green, a parliamentary assistant to David Burrowes MP, was forced to stand down after after calling feminists “whingeing imbeciles” who “need a good slap round the face”. making a series of sexist and bigoted remarks on Facebook. Green told his Facebook friends he was “sick to the back teeth” of “wretched women MPs who seem to be constantly going on about there not being enough women in front-line politics”. In another recent post on the social networking site, Green applauded proposals to close BBC3, saying that “all it seems to do is prop up the common scum lifestyle”. 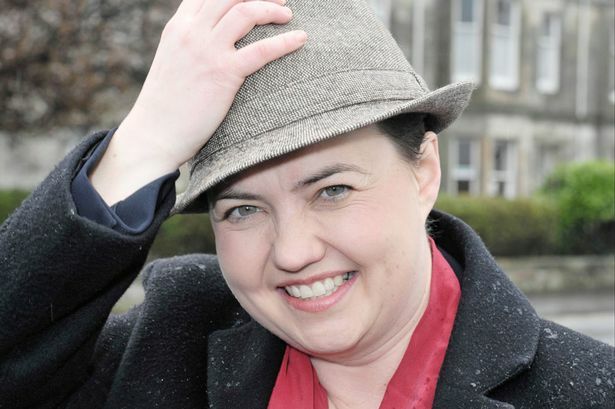 25 November 2011: New Scottish Conservative Party leader Ruth Davidson reveals a shake-up of her back-room team. Barely three weeks since she took over, it has been announced that the party’s director of media, Ramsay Jones, is to move to an expanded role as director of political affairs. He will work with Ms Davidson and party chairman David Mundell and will be based mainly at party headquarters in Edinburgh. I was invited to speak at the Glasgow University Conservative Association St. Andrews dinner, in the Bridie Library in the Students’ Union. Arriving in Glasgow around lunch-time, I was able to visit the Glasgow School of Art (Charles Rennie Mackintosh), and see their current “Glasgow Girls” exhibition. Excellent – worth a visit. On then to the Willows tea-rooms in Sauciehall Street, again with a strong Mackintosh theme, where I was shown around by Rachel, a well-informed waitress at the Willows. Shortly after seven, a taxi delivered me to the Union, all done up in black tie (OK, well burgundy velvet in this case), Crombie coat and trilby hat, every lefty’s stereotype caricature of a Tory politician – and straight into a couple of dozen vociferous student protesters, chanting slogans about education cuts and “Tory Scum”. I anticipated problems, but I had reckoned without two of Glasgow’s finest, in hi-viz tabards, who elbowed me through the riot and into the building. I understand that a much larger force arrived soon afterwards and removed the unwashed proletariat. The fracas on the pavement failed to deter sixty or so diners, who tucked into traditional Saint Andrews fare, Scotch broth, haggis with neeps & tatties, cranachan and port. The group included a couple of MSPs and a host of candidates for public office. Then it was time for me to sing for my supper, or at least propose the toast to Saint Andrew. I have rarely met a more enthusiastic audience. I mentioned Dan Hannan, and they burst into spontaneous applause. I commended the Daily Express “Get Britain Out of the EU” campaign, and they cheered to the echo. I spoke dismissively about climate hysteria, and they roared approval. It’s worth mentioning that the Glasgow University Conservative Association, under the leadership of its President Ross MacFarlane, is no mere debating or social club. These are serious campaigners who have been pounding the streets of Scotland on the Party’s behalf. These are the future of the Conservative Party. And like so many Conservatives they’ve had enough of the EU, and they want out. They’ve also lost patience with the global warming lobby. They don’t believe it, and they won’t pay for it. My fear is that the Party’s high command has simply failed to notice the way the wind is blowing. I wonder just how long David Cameron can lead us deeper into the EU, and into the battle for “climate mitigation”, before he notices that the troops aren’t following behind. He risks becoming dangerously exposed.